"An invention, Doctor. First potassium nitrate, and now if he can find some sulfur and a charcoal deposit or ordinary coal..."
This episode starts off oddly. The main officers of the Enterprise are preparing to beam down to the planet Cestus III to attend a dinner party on the invitation of Commodore Travers, known to "set a good table." Spock is suspicious that their host is requesting their tactical aids also beam down for the "party." When the team materializes on the planet, they find that it has been destroyed. The weird part is that they are completely surprised. Usually, there are scans that reveal all sorts of details; for example, the complete destruction of a colony before they beam down. Here, there is no mention of any security screens (the usual excuse for why they cannot scan for danger before falling into it) and they find themselves immediately under attack from an unseen enemy. This is quickly forgotton in the exciting battle sequence on the planet. Good special effects and the sheer violence of the fight is unique for The Original Series, in which most of the conflict is with bloodless phaser fire. Kirk uses a mortar to drive off the attack on the outpost and the aliens return to their ship, fleeing to an uncharted part of the galaxy. Kirk orders the Enterprise to pursue with the intent of "punishing" the aliens for attacking a Federation outpost. However, as they pass a solar system in the unknown space, a tractor beam captures both the alien ship and the Enterprise. A race that identifies themselves as the "Metrons" abhors the violent intent of the two ships and creates a situation in which the two ships captains are transported to a planet and must settle their conflict in hand-to-hand combat. They provide the materials necessary for the combatants to fashion weapons capable of destroying each other. Kirk finds himself facing a large reptilian creature that the Metrons have called a Gorn. What follows is an intriguing game of survival as each uses the available materials to try and kill each other. The Gorn is immensely strong and also shows himself to be a clever opponent. Kirk must somehow defeat this enemy to save himself and his crew. This is simply a classic "bug-eyed monster" piece of science fiction that harkens back to the Golden Age of the genre, but with an added layer of the questionable naure of the human incursion into the space of an alien race. Without proper exploration, the humans had established an outpost in territory that was claimed by others and when the outpost is destroyed, find themselves possibly on the wrong side of the equation. This one is fun and interesting, earning three Enterprises. The Alternative Factor is one of the strangest and most puzzling episodes in all of The Original Series. Travelling through space, the Enterprise experiences an unprecedented cosmic event that seems to be everything in existence "winking out." Spock has no explanation and Star Fleet issues an alert as it seems possible that this is a prelude to an invasion from a parallel universe. All nearby star ships are withdrawn from the area and the Enterprise is on its own, investigating the remarkable phenomenon. Tracing the center of the effect to a nearby planet, Spock is surprised to find reading of a possible humanoid on the seemingly dead planet. After transporting down, they find a one-man spacecraft and an injured man who calls himself Lazarus (Robert Brown). He claims to be battling a creature who once destroyed his world and threatens to destroy the universe. This is one episode where the fate of the entire universe as we know it is on the line. Kirk and Spock are like a science fiction Sherlock Holmes and Watson as the sift through the available scientific information, little of which makes any sense, and the bizarre testimony of Lazarus who speaks in riddles, doubletalk and outright lies. In many ways the deck is stacked against us in trying to puzzle out the threads of the mystery. I doubt much of the science would stand up under close analysis; we know that matter and anti-matter cannot meet or annihilation will occur, but there is confusion in how this actually happens. The problem here is that we must follow the clues in order to understand what is going on, but the clues are inconsistent. I sense that this is another episode that, although intriguing in its premise, was ultimately found not to work particularly well in execution. Since a financial point of no return had been reached, the show had to be finished and I am certain that the final version here pleased no one. Cast Note: Robert Brown later played the lead role in the Here Comes the Brides television series, notable for also starring singer Bobby Sherman and Starsky & Hutch's David Soul as his brothers. Also appearing on the show as their nemesis was Mark Lenard, a.k.a. Sarek, Spock's father. Call me dense, but I have never really figured this one out in such a way that I feel confident that I know what goes on. Of course, anyone can make up his own "interpretation." I think some scene is lost near the end. This complex puzzler gets two confused Enterprises. Image Transfer Review: Interestingly, both of these episodes seem to take place on planets with very similar topography (or perhaps not so interesting). The transfer is actually somewhat grainy in The Alternative Factor on occasion, although I didn't detect the same problem with Arena. But, by and large, the image is crisp and colorful with nicely rendered skintones. Fortunately for Arena, the costume of the Gorn looks no less cheesy here than it ever has. Audio Transfer Review: Nice sound quality in both episodes from the Dolby 5.1 remix. Arena features two battles with rampant sound effects. The Alternative Factor has the weird space distortion of Lazurus battling his foe. Although visually not very interesting, there is some nice thump to the sound effects. Extras Review: Small booklet and trailers. Oh well. 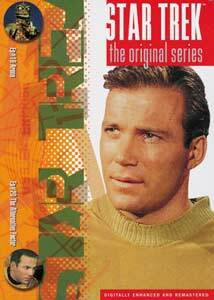 Two pretty good episodes are on this disc, one straightforward classic sci-fi and the other a puzzling cosmic mystery. The first has Kirk in a man v. lizard battle with the captain of an opposing spaceship. The second has the universe "winking out" and Kirk and Spock must figure out the how and why. Each is interesting in its own way.